The drive from Santa Rosa to Sonoma along Highway 12 is among the most beautiful in Sonoma County. The one-lane road threads tunnels of trees through a narrow valley of vineyards and farms rising to densely forested oak and pine-covered hills. The route traverses the Valley of the Moon, the name of a Jack London novel celebrating the milk-and-honey glory of the area, past Kenwood and Glen Ellen, but as it approaches the town of Agua Caliente, the view changes abruptly. A sign announces the end of the scenic drive, and in an instant the surrounding landscape morphs from rural to urban. Instead of chateaus and verdant vineyards, there are car-repair shops, second-hand stores and Mexican restaurants. The scenic drive may have ended, but it's by no means the end of the roadside attractions. While most people pass through the area on their way to weddings or winetasting in Sonoma and beyond, the two-mile stretch of Highway 12 on the outskirts of the Sonoma city limits has a story to tell, and good food to eat. I call it the Taco Trail. 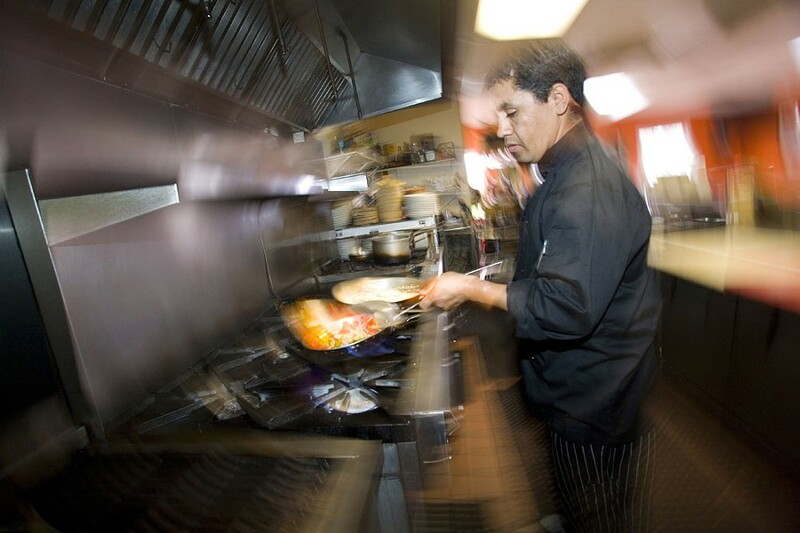 HOT SPRINGS Chef and co-owner Antonio Barrios prepares chicken huaraches at Rancho Viejo. The unincorporated region between Agua Caliente and El Verano Road is collectively known as "the Springs," encompassing the towns of Agua Caliente, Fetters Hot Springs, Boyes Hot Springs and El Verano. Once upon a time, the towns were all train stops; in the late 1800s, the area was a resort destination for San Franciscans and day-trippers who came to soak in the thermal mineral waters at resorts like Agua Caliente Springs. Like the simple summer cottages that sprang up along the Russian River near Guerneville, there was similar development in the Springs area—modest cottages on small lots for vacationers looking to escape the summer fog of the city. The Great Depression sank the hot springs business, but Agua Caliente Springs lives on as the Sonoma Aquatic Club, a private swim and fitness club with two pools and a jacuzzi heated by thermal springs. A fire in 1923 wiped out many of the buildings. One of the few that survived is now occupied by Taqueria La Hacienda, a comfortable sit-down restaurant with an encyclopedic menu and full bar. The legacy of the area lives on, too, in the small restaurants and shops along Highway 12. 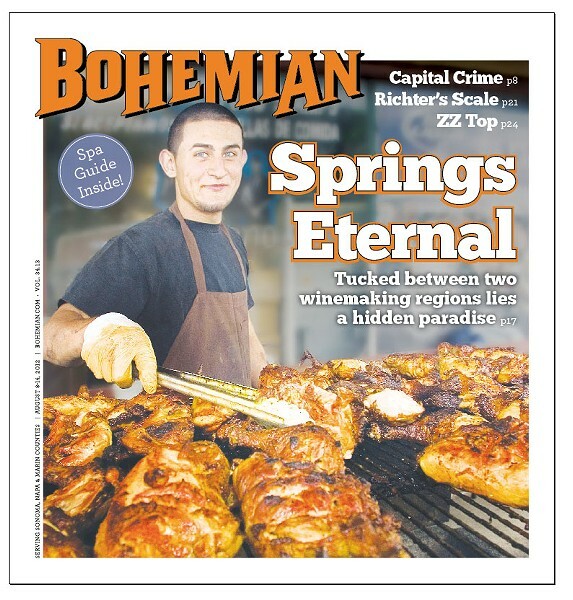 If you roll into the Springs area from Santa Rosa around lunch time, one of the first things you'll see—and smell—are the chickens grilling outside of El Brinquito Market, a yellow grocery store with a taqueria inside. The smoke from the wood-fired grill wafts over the road, compelling you to pull over. Heed the call. The whole, butterflied chicken is available either to go or on picnic tables under a tarp next to the market. Grab some beans, tortillas, salsa and a beverage from inside to go with your pollo asado, and you've got the makings of an outstanding lunch. Next to El Brinquito are not one but two more carnicerias, or meat markets; in all, there are five carnicerias along the taco trail, further evidence of the strength of the area's Latino business community. The first to open—25 years ago—was Chapala Market in the Fiesta Plaza shopping center, also home to Sonoma Taqueria, a full-service taqueria that mixes in some American classics like burgers and fish and chips. But you don't want a burger here. Stick with the tacos or an order of chilaquiles, a spicy, messy mix of tortilla chips, chile sauce and scrambled eggs. ARRACHERA ARIETTA Arturo Ulloa in his Chapala Market, which he runs with son Carlos. 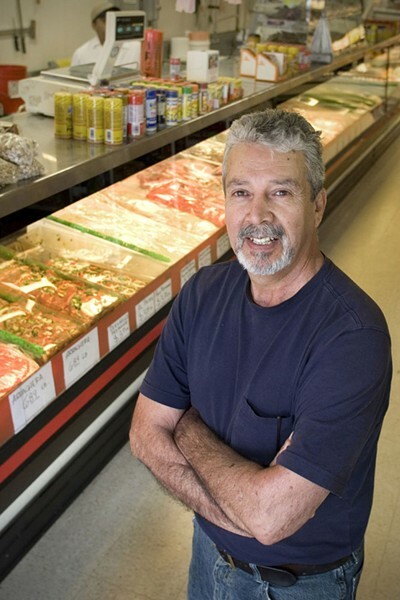 The meat counter has a full-service butcher, and the spotless display case is loaded with arrachera (also known as flat meat or carne asada) and virtually every other cut of beef, pork and chicken. The market makes its own carnitas, available to go on weekends. I also spotted what Ulloa called tomatillos milperos, or cornfield tomatillos. The marble-sized tomatillos are much smaller than the typical tomatillo, and work great for salsa, Ulloa says. In the state of Jalisco, where he and many other Springs residents hail from, the plants are typically grown in and around fields of corn. The word "milpero" comes from milpa, or cornfield. Artist Michael Acker has lived in the area since 1997 and serves as treasurer of the Springs Community Alliance, a local business and community improvement group. He's also an amateur historian of the area. "It was a very thriving community until the 1950s," he says. In the 1960s, Acker adds, the neighborhood fell into disrepair and acquired a reputation as a hangout for outlaw bikers and druggies. In the early 1970s, the most famous (and infamous) restaurant in the area was Juanita's, owned by dynamic restaurateur Juanita Musson, who allowed flocks of chickens to roam the dining room and threw plates of food at diners who dared leave food on the table. As Sonoma County's wine and agriculture industry grew in the 1970s and 1980s, so too did the need for immigrant labor, and the Springs area provided affordable housing for low-income laborers. The area's Latino population continued to grow, and about 10 years ago the majority of the neighborhood's population became Latino. "Now we're getting to be a real Mexican food area," says Acker. Kara Reyes is director of family planning at La Luz, a social-service agency that serves the community's Latino and low-income residents. She's lived in the area for 15 years. "This neighborhood has always been the low-income area of Sonoma," she said. "It's the other side of the tracks. It's almost like there's an invisible wall at El Verano." Before it disbanded, the Sonoma County Redevelopment Agency helped to fund street and business improvements along the area's commercial corridor. Construction of sidewalks and streetlights was completed for half of the neighborhood, from El Verano north. (Plans were nearly complete for the rest of the project; the community is still waiting on the state to revive the project.) As in Santa Rosa's Roseland district—also primarily Latino and not in the official city limits—the agency provided facade-improvement loans that helped businesses to add some curb appeal. Today, the small homes, tight lots and winding streets have created a hodgepodge of development that's home to a thriving Latino community drawn to the relatively low-cost housing. While tourists visit the Sonoma town plaza and the restaurants and winetasting rooms that surround it, the Springs is where many of the region's vineyard, farm and service workers live and eat. YUCATAN PRIDE Genny and Antonio Barrios of Rancho Viejo Restaurant. The Springs may have a scruffy appearance, but business is flourishing. The small commercial lot sizes have helped keep large retailers out in favor of locally owned, family-run businesses. And because many of the neighborhood's Latino residents lack access to transportation, they depend on local shops and restaurants. "A lot of local families built their businesses here from the ground up," says Reyes. And in spite of the economy, she says, local businesses are doing very well. "Almost every month, something new is opening." 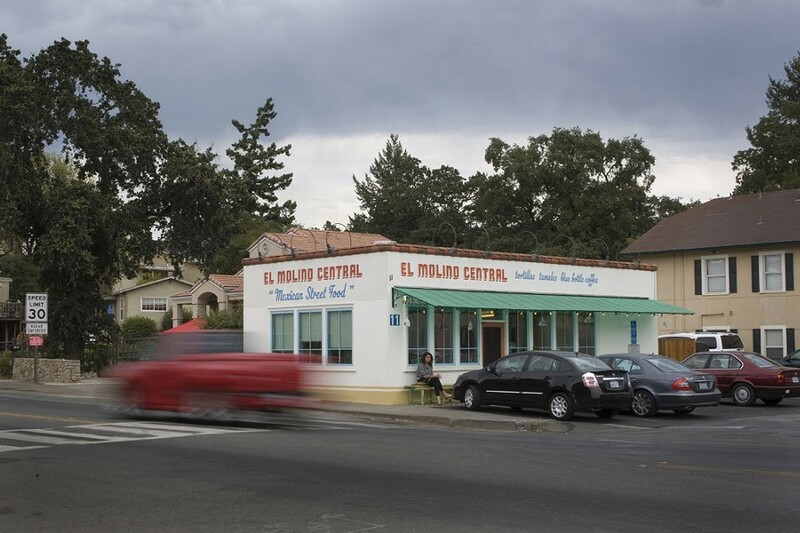 One of the must-stops on the Taco Trail is El Molino Central. To the extent any visitors are familiar with the neighborhood, it's due to Karen Waikiki's outstanding restaurant. El Molino is a departure from the taco and burrito fare that dominates most Springs restaurants, and specializes instead in Oaxacan food, especially with its superb hand-made tamales. El Molino means "mill," and indeed the restaurant mills its own masa to make tamales and tortillas. It also notably stands out for its use of organic and locally sourced produce and meat. The three-year-old Rancho Viejo is another favorite on the Taco Trail. Co-owner Genny Barrios lives in the neighborhood, and is out to bring a healthier kind of Mexican food to the residents. Like El Molino Central, Rancho Viejo gets much of its produce from local farms and the Sonoma farmers market, where, incidentally, Barrios is a regular vendor, selling ceviche, empanadas and other prepared food. Originally from the Yucatan, Barrios brings several peninsula specialties to the menu, such as cochinita pibil, a classic dish of slow-roasted, pulled pork in a citrus marinade tinted red with annatto seed; pok chuk, pork chops, also citrus-marinated; rellenos negros; and panuchos, thick masa patties topped with beans and beef or pork. Instead of lard, she cooks with olive oil—as is the tradition in the Yucatan, thanks to the Lebanese traders who landed in the Caribbean state of Mexico. "For us, it's not just business; it's about showing Sonoma what real Mexican food is all about," says Barrios. Taco trucks are a regular sight along Highway 12. One of the more regular ones is Tacos Acapulco, conveniently parked across from La Michoacana, purveyor of exotically flavored ice cream and popsicles. What drew me in was a banner advertising "Pedro-style" tacos. What's Pedro-style? Turns out it's just named after one of the owners. I couldn't detect any signature style in the carnitas taco, but its sand-dollar-size taco was great, especially in its well-prepared meat. After a taco, cross the street and head directly to La Michoacana, another necessary stop. The store serves all the basic flavors, but it's the tropical fruit flavors (mamey, guanabana, nanche) and interesting combinations like pineapple and chile that are the real attraction. Lest you forget where you are, you can also get nachos, chicharron and cueritos, a pickled pork skin, but I'd stick with the ice cream and paletas.